by Brad Sorgen, Event Marketing Specialist at STIHL Inc.
I’ve (We’ve) seen reporters try the speed climb, the logroll and the boom run. But this was a first. Lauren Berlingeri, a model and former collegiate soccer player, hoped to conquer the ax throw, single buck, speed climb and stock saw in one weekend. Dave Jewett, longtime STIHL® TIMBERSPORTS® Series competitor and ESPNU announcer for the Collegiate Series, was her lumberjack sports coach and trainer. We started her off “easy” with the ax throw. Within in three throws, she hit a bull’s eye. A natural? Next we moved on to the stock saw. To the inexperienced eye and casual fan, this discipline looks simple. Make two cuts -one down, one up- through a 16-inch block of wood. Dave quickly explained to Lauren that this was the most underrated event, especially by younger and newer competitors. “Just let the chain saw do the work and you guide it,” coached Dave. We suited up Lauren in her safety gear – chaps, eye and ear protection and she was ready to go. Once again, she mastered the discipline with hardly a bat of an eye. Up next for Lauren, the single buck, with the very appropriate nickname, the misery whip. 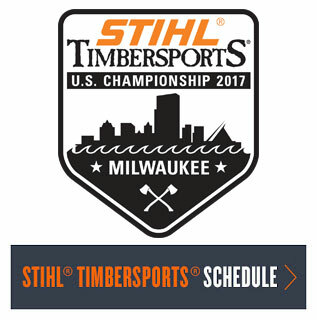 This discipline is the most physically enduring of all six chopping and sawing disciplines in the STIHL® TIMBERSPORTS® Series . Using an old-fashioned crosscut saw, the competitor makes one cut through 19 inches of wood. The quality of the crosscut saw is a big factor in this discipline. Since Lauren was using one of pro competitor Mike Slingerland’s practice saws, she was more challenged in this respect. The single buck gave Lauren a true test of strength and stamina though she proved to be a quick study, listening to every coaching tip that Dave shared like keeping the saw level and using her entire body to work the saw. When she completed her cut, she looked 100-percent physically exhausted. She clearly understood why the discipline had its nickname. We saved the best for last as far as Lauren was concerned, the speed climb. She was quite eager to try the speed climb after seeing the college students, who were competing in the Mid-Atlantic woodsmen conclave, scurry up and down the poles. Lauren was slow in starting the speed climb. Dave instructed her to really throw her gaffs into the tree and keep her body pulled in close. Slowly but surely, she climbed to the top of the 40-foot pole. Once she reached the top, she broke out into a huge smile and took in the view. Check out Lauren’s adventure with the STIHL® TIMBERSPORTS® Series here … and remember kids, don’t try this at home.